The deep lustre of a piano-like finish and the highlighting of delicate grain patterns accentuate the beauty of these fine woods. Gold finished side grilles complete an outstanding chime case that is smart and dramatic—perfectly in tune with tasteful furnishings. Features the Sylvan Chime in ungarnished simplicity. 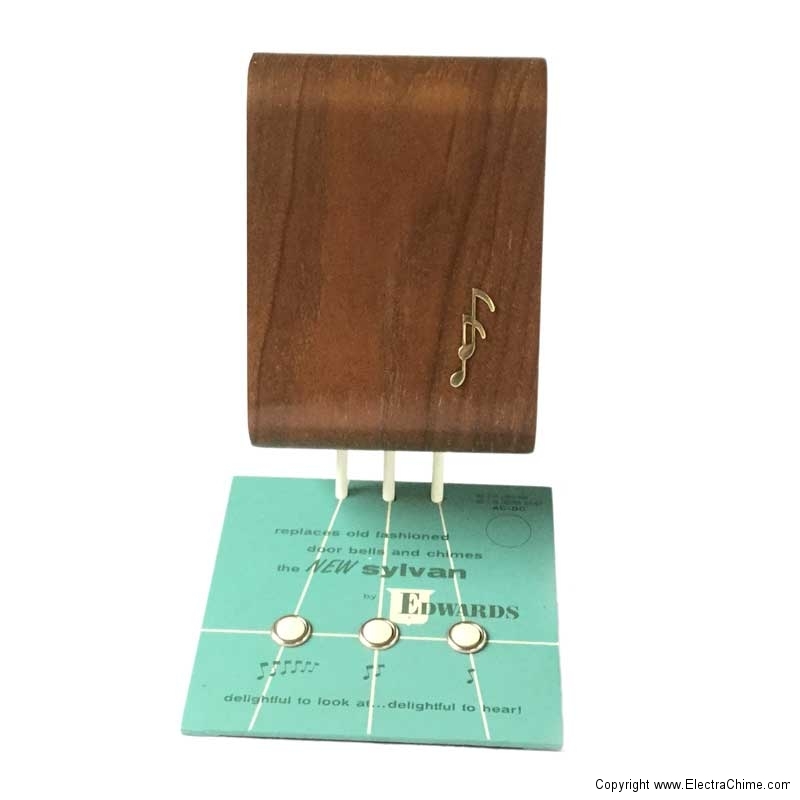 Three push buttons invite self demonstration of the chime’s melodious one note, two note and Vibrechord tones. 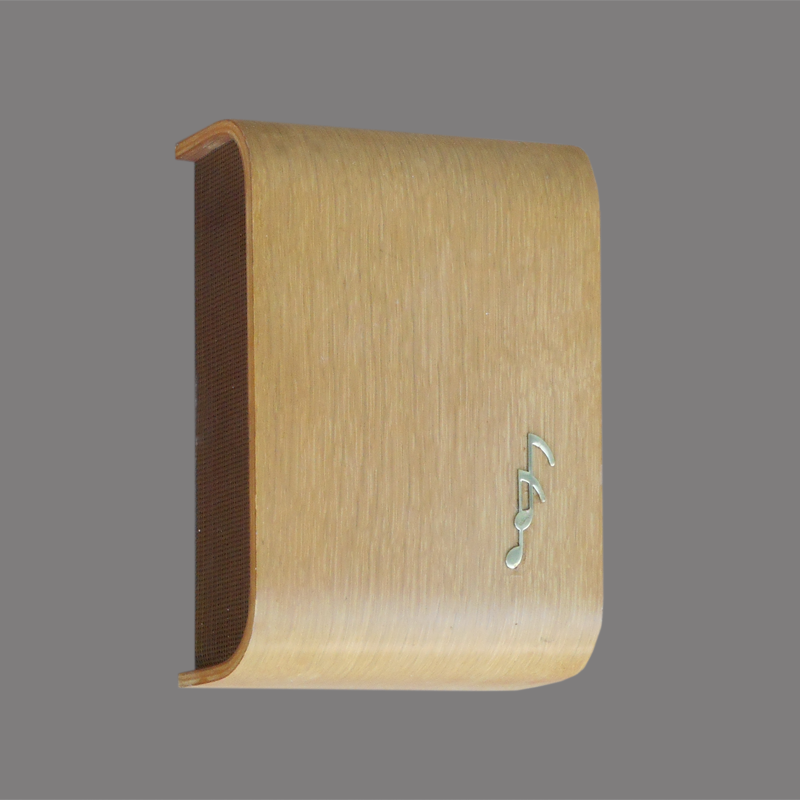 Chime and display are a “natural” combination for hardware or gift store selling. An entirely new innovation in chime displays, it’s battery-powered for complete freedom from electric outlets and dangling cords. More versatile and convenient than any dislay you’ve ever seen, it may be placed on shelves, glass counter tops, islands … anywhere! Four replaceable flash-high batteries last for months and months. —marketing copy for the introduction of the Sylvan Chime and display. 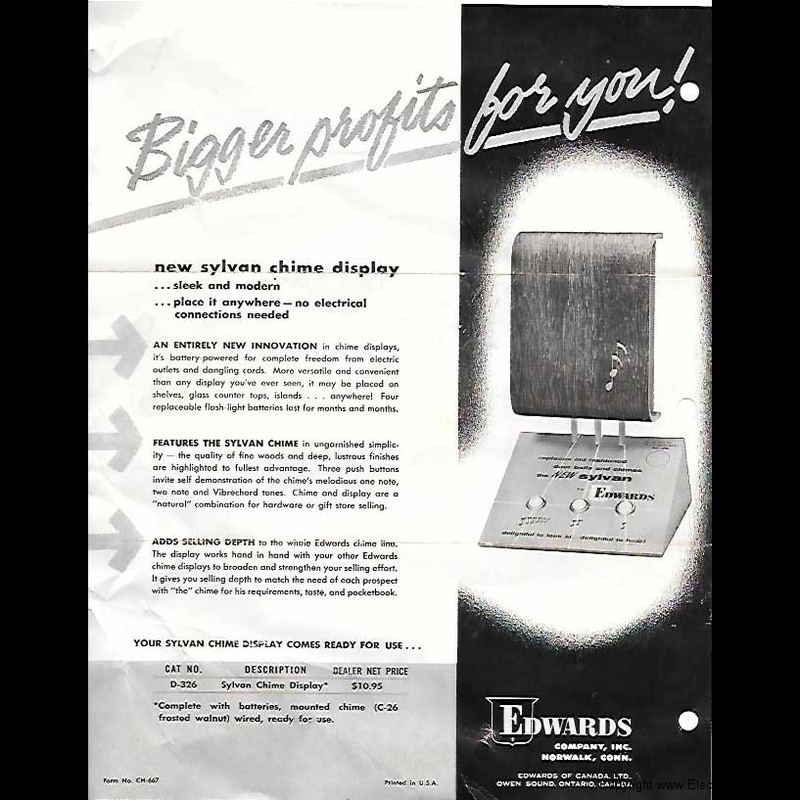 Vibrechord was a trade name used by Edwards for their repeating chimes. 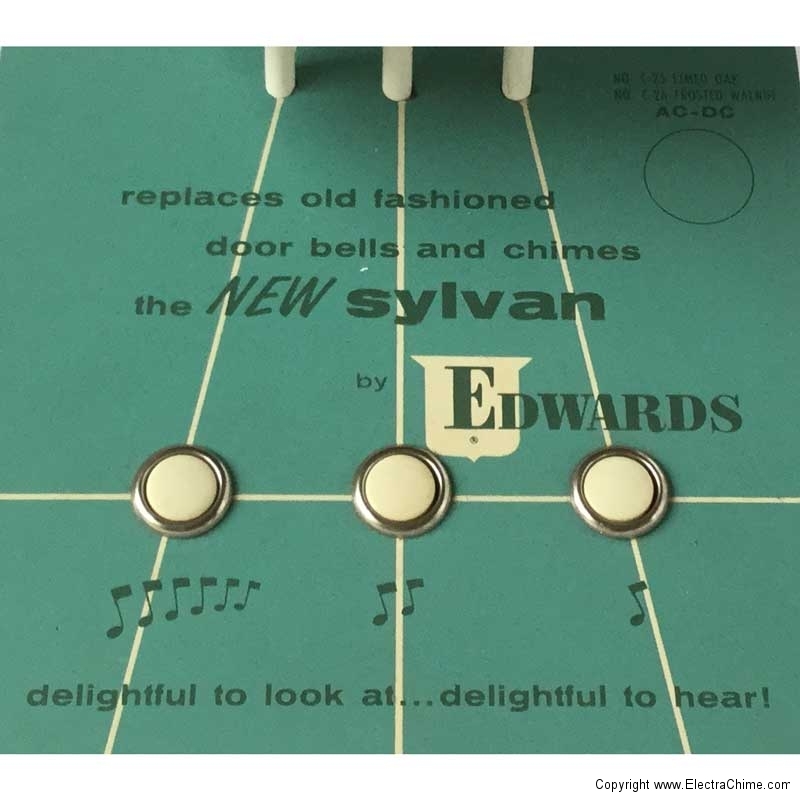 In addition to the common”ding-dong” and “ding” calls of typical doorbells, the Sylvan would also repeat “ding-dong-ding-dong-ding-dong” so long as the pushbutton for this circuit was depressed. 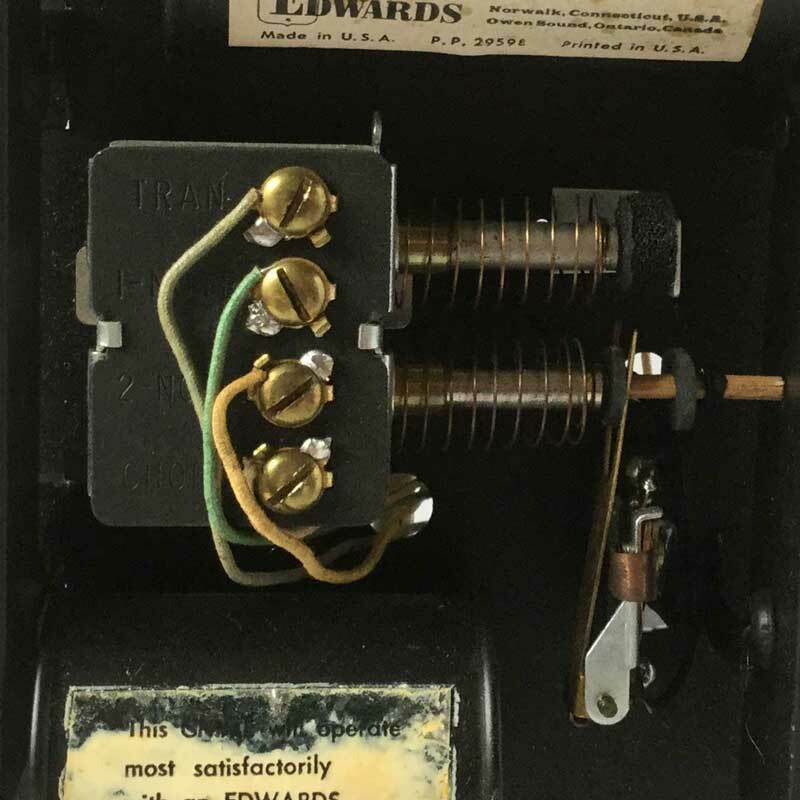 This is accomplished by means of a normally open micro-switch that would momentarily close each time the the plunger recoils to re-propel the plunger back through the solenoid. The plunger only comes to rest once the doorbell button is released. This produces a similar effect to other repeating chimes such as the Friedland Warbler. 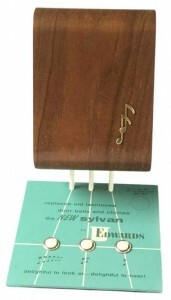 The Sylvan is shown in Frosted Walnut and was available in Limed Oak as the C-25. Materials Chime: Bent plywood, walnut veneer, gold-finished steel grilles, metal tone bars. Display: Oak, masonite and steel. Dimensions Chime: 5 3/4 inches wide; 7 1/2 inches tall; 2 1/4 inches deep. Display; with Chime: 7 inches wide; 7 1/2 inches deep, 12 1/4 inches tall.